Uefa is against the plans, which will be raised when Fifa's ruling council meets in Rwanda on Thursday and Friday. Earlier this year, a consortium lead by Japan's SoftBank, and backed by Saudi cash, wanted to invest $25bn over 12 years in the two competitions. It's unclear if the new proposals have the same financial backing. Opposition to the plans from Fifa Council members - including Uefa president Aleksander Ceferin - resulted in talks being suspended shortly before the start of the World Cup in June. The revised format for the Club World Cup was outlined in May and would see the contest held every four years. It's believed 12 top European teams would be among the global participants. Manchester United and Liverpool are thought to be amongst the sides that Fifa wants to see take part in the inaugural competition in 2021. 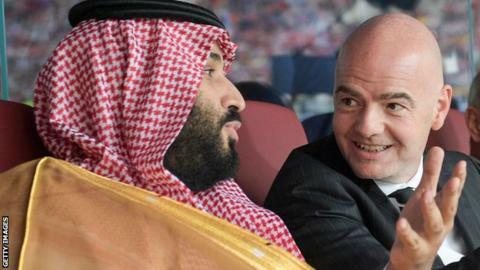 Fifa president Gianni Infantino is likely to face questions at the meeting over his relationship with Saudi's Crown Prince, Mohammed Bin Salman, in light of the country's recent admission over Khashoggi. Infantino has met senior Saudi officials four times in the past year - including one trip to open the Saudi Football Association's new website. Why is Uefa against the plans? But Infantino's plan for a 24-team tournament - either played annually or every four years and replacing the Confederations Cup - will be seen as a direct threat to the pre-eminent position of the Uefa Champions League. A global Nations League - similar to Uefa's new format - is also controversial given Fifa's plan for outside investment.